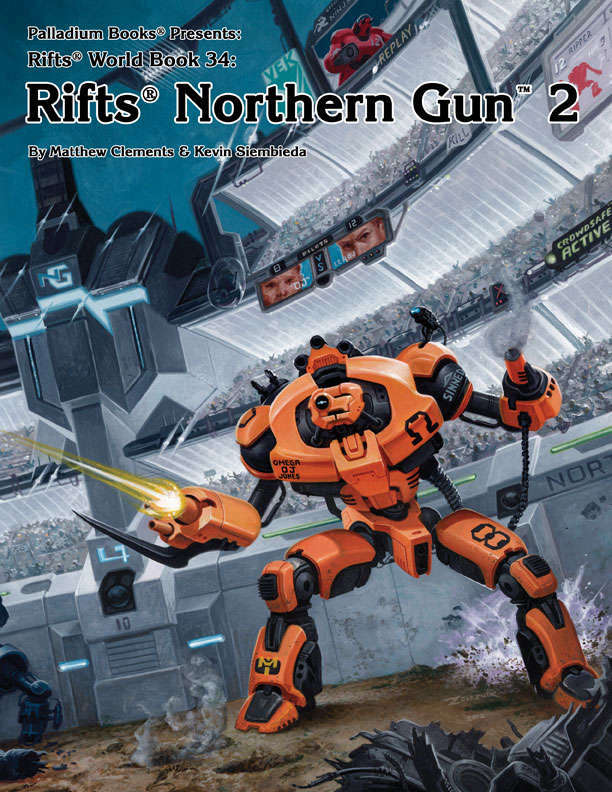 Rifts® Northern Gun™ Two is an epic World Book that contains a wealth of information, power armor suits, ride armor, drones, vehicles and gear from the largest arms dealer on the continent: Northern Gun™. Plus details about the Robo-Gladiatorial Arena whose battles are being televised throughout Michigan, Canada and the Chi-Town ‘Burbs. May be used with Northern Gun™ One or as a standalone sourcebook. 30+ suits of M.D.C. body armor and 20+ types of armored clothing. 10 robot haulers and drones. 15 combat vehicles and amphibious watercraft. 14 hovercycles, 8 motorcycles, 4 aircraft, 4 jet packs and 15 ground vehicles. Pirates, amphibious gear, adventure ideas and more. 256 pages written by Matthew Clements and Kevin Siembieda.